With the right equipment, you have your most important tools close at hand, while relieving your body. Here is a guide on how to make your own Ergo-belt with the material pockets and tool holders you need in your profession. All our craftsman trousers have a comfortable and normal fit, but the models are a little different. Here is an overview of our craftsman trousers to help you find the one that suits you the best. We have workwear for craftsmen, service workers, flameproof workwear and visibility clothing with all the functions you need in your daily work - with a fit adapted for women. Here is an overview of our workwear clothes to help you find the right workwear for your profession. Working in knee-length positions is stressful for the body and for the knees in particular. Therefore, it is important to use the right type of kneepads that fits and protects your knees optimally. Here is a guide on levels and types of knee protection. To be comfortable when you work, it's important that you wear the right size of your workwear. To make sure you choose the correct size for a perfect fit, please use our size guide. Our high-tech and functional garments are designed to protect you even when you have to work in heavy downpours, icy winds and snow. At the same time, they transport away excess heat and moisture. Here is an overview of our underwear so that you will find the right base and perform from the inside out. Dressing according to the 3-layer principle is a smart and effective way to stay dry and avoid cooling the body. Here is a guide on how to stay dry, warm and protect you in all weather with the 3-layer principle. 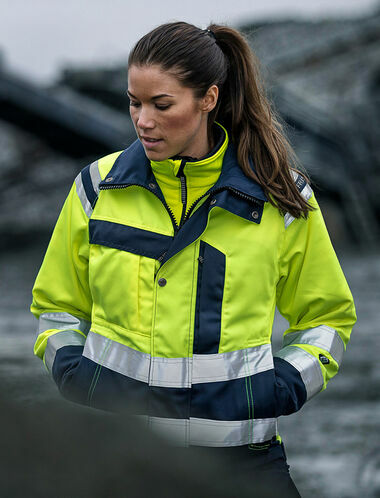 ​​​​​​​In the Fristads High Visibility Clothing System we have co-certified our collections, so garments in 1 or 2 can be combined in various ways to obtain a higher safety class.